There have been several instances which have led us to believe that Apple is seriously considering creating an Apple Car which is purported as ‘Project Titan’. The Cupertino firm’s latest patents further consolidates this fact. The patent in question does all the stuff right from unlocking the doors to creating temporary Car keys to turning on the radio. The U.S. Patent No. 9,351,102 titled ‘Accessing a vehicle using portable devices’, describes using an iPhone to unlock, start and activate other settings inside a car – all over Bluetooth. 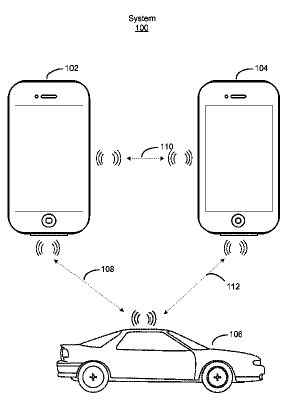 This patent relates to wireless communication using portable computing devices to access a vehicle. It describes how a an iPhone or an iPad could access the car’s inbuilt computer to instruct it to perform several functions. For instance, it could unlock the vehicle’s doors, unlock storage compartments, start the engine, interact with the entertainment system, activate GPS, activate the dashboard console, adjust the seats, activate the automatic parking system, and open the car’s sun roof. The application basically connects with the car’s WiFi, Bluetooth, or a cellular network. Another interesting feature about this patent is that it allows the owner to create temporary “keys” for others. The primary portable device can let a “secondary portable device” access the vehicle by transmitting the access credentials to the secondary device. While the owner will have full access to the car, the secondary user can interact with limited features. The primary device can select what features the secondary device can access. We know for a fact that Tesla, Audi, Volvo and Ford have already created phone applications and that which allows controlling the car’s inbuilt computer. However what is very interesting about Apple’s patent is that includes controls for secondary drivers. This article is a part of our series of web articles – Latest from the Greatest. Innovation drives competitiveness! That is the beauty of innovation which fuels every great company to constantly innovate and come up with great ideas, great prototypes and finally great products. Having a patent is absolutely critical and act as a core ingredient to achieve such greatness. Leading companies compete on the impact of their innovations in the marketplace. At Citius Minds, we constantly mine patents to read into the insights into what the future holds. Through these series of web articles, we will be covering latest patents that the leading companies have filed and try to read into how their research is panning out and what great products are lined up for us to grab our hands on. on this subject matter. Really.. thanks for starting this up. This site is something that’s needed on the internet, someone with a little originality! Greetings from California! I’m bored at work so I decided to browse your blog on my iphone during lunch break. I enjoy the information you provide here and can’t wait to take a look when I get home. I’m surprised at how quick your blog loaded on my phone .. I’m not even using WIFI, just 4G.. Excellent site! As if they haven’t made everything more expensive. Who needs an Apple car.. The article is really good and gives a great information. Really excited to see the apple cars running on the roads. Is Apple really making a car? We can hardly afford a Macbook, who is going to buy a car? Apple wants to cover the entire market. It would be better if it would focus on their core strength. Good Information. Hope we get to see the apple car soon..